INTRODUCTION: In the Iranian Accreditation System, leadership and management standards have been almost ignored and not paid enough and necessary attention to the structural components and the infrastructures standards in management and leadership sections. Governing body, medical staff, chief executive officer (CEO), and nursing management standards are inadequate and lack accountability. These standards could lead to reform and finally provide the context for accomplishment of an appropriate accreditation program. MATERIALS AND METHODS: This is a descriptive, comparative, and qualitative study. It was done in two phases. The first phase included literature review of the standards of the selected countries followed by comparison of the standards of the board of trustees, medical staff, CEOs, and nursing management standards to develop the primary framework for Iranian hospitals. In phase two, the primary framework was validated true three rounds of Delphi technique. RESULTS: Surveying the accreditation system standards in selected countries included the USA, Egypt, Malaysia, and Iran. It was found that the management and leadership standards were classify as governing body, medical staff, CEOs, and nursing management standards. The result of this study provides a framework for improvement of the Iranian national accreditation program. CONCLUSION: In regarded to the importance of the leadership and management standards in reform and change and promotion of the health services quality, efficiency, and effectiveness, the results of this study showed that the present standards of the Iranian accreditation assessment system and guidelines lack the necessary infrastructures for implementing a successful national accreditation program. Hospitals and health-care services are vital components of any well-ordered and humane society and will indisputably be the recipients of public and societal resources. The fact that hospitals should be places of safety, not only for patients but also for the staff and the general public, is of the greatest importance. Quality of hospitals and health-care services is also of great interest to many stakeholders, including governments, nongovernmental organizations targeting health care and social welfare, professional organizations representing doctors, patient organizations, and shareholders of companies providing health-care services. However, accreditation schemes are not the same thing as government-controlled initiatives set up to assess health-care providers with only governmental objectives in mind; ideally, the functioning and finance of hospital accreditation schemes should be independent of governmental control. How quality is maintained and improved in hospitals and health-care services is the subject of much debate. Hospital accreditation is a recognized certificate in which hospitals can achieved. It is not just an issue of hospital quality and safety; there are financial factors as well. Hospital accreditation has been defined as “A self-assessment and external peer assessment process used by health-care organizations to accurately assess their level of performance in relation to established standards and to implement ways to continuously improve.” Critically, accreditation is not just about the standard setting, but there are also analytical, counseling, and self-improvement dimensions to the process. There are parallel issues around evidence-based medicine, quality assurance, and medical ethics, and the reduction of medical error is a key role of the accreditation process. However, there is limited and contested evidence supporting the effectiveness of accreditation programs. Good leadership and management are important for the success of any organization. In a health-care organization, good leadership and management is more than just important; it is absolutely critical to the organization's success., Who are the “leaders” and “groups of leaders” in an organization is one of the main considerations in the accreditation process. In most organizations, there are two groups of leaders, the governing body, and the chief executive officer (CEO) and other senior managers which may be referred to collectively as the “C-suite.” If the governing body and the senior managers do not work together, the organization's goals are unlikely to be met and sooner or later the latter group departs. The same is true in a health-care organization, the governing body selects the CEO; but most health-care organizations especially hospitals have a third leadership group, the leaders of the physicians and nurses and other licensed independent practitioners whether employed or voluntary, that provide services in the organization. In a hospital, the physicians and other licensed independent practitioners are organized into a “medical staff” and the leaders of the medical staff contribute to the leadership of the organization. A hospital is the most complex health-care setting in which these three groups of leaders must collaborate in order to successfully lead the organization. In a hospital, the third leadership group comprises the leaders of the organized medical staff. Only if these three leadership groups work together collaboratively, to exercise the organization's leadership function, then the organization reliably achieve its goals such as high-quality, safe patient care, financial sustainability, community service, and ethical behavior. Only the leaders of a health-care organization have the resources, influence, and control to provide for these factors. It is the leaders who can together establish and promulgate the organization's mission, vision, and goals. It is the leaders who can strategically plan for the provision of services, acquire and allocate resources, and set priorities for improved performance. These approaches depend on systematic thinking, recognizing that the hospital, or other constituent, is a system and that the system can and must be designed to compensate for the errors that are likely to be made by any of its components. In health care, although the cognitive and technical skills of physicians are critical to the quality of patient care, these same physicians, no matter how competent and committed, will make errors. The best protection against those errors is generally not to be found only in the physicians becoming more competent and more committed. Even in those cases in which greater competence or more commitment could be attained, the protection is to be found in the processes within which the physicians work. These processes can be designed to prevent human errors, to stop the errors before they reach the patient, and to mitigate the errors' effects on the patients they treat. Hence, achieving safety in patient care requires competent, committed health-care professionals working in safely created processes. Every hospital has a leadership structure to support operations and the provision of care. In many hospitals, this structure is formed by three leadership groups, the governing body, senior managers, and the organized medical staff. Regardless of how the individuals appointed, those who are responsible must be clearly identified. Two specific leadership groups are directly responsible for overseeing the activities of those who provide patient care, the medical staff leadership and the nursing executive. These two organizational leaders are responsible for oversight of the quality of care of the physicians and other licensed independent practitioners and of the nursing staff, respectively. Since the governing body of different hospitals may assign responsibilities differently to each of the leadership groups, there is no one size fits all set of assignments and each hospital must identify the responsibilities of the leaders in that hospital. While many of these responsibilities may be shared across leadership groups, other responsibilities are assigned to a specific group. Although the governing body is ultimately responsible for the quality and safety of care provided by the hospital, many of the evaluations and decisions about the quality and safety of care and how to improve them require collaboration and teamwork among the leadership groups. However, health-care organizations have unique characteristic. That is, the CEO is not the only part of the organization's leadership that is directly accountable to the governing body. In health care, because of the unique professional and legal role of licensed independent practitioners within the organization, the organized licensed independent practitioners in hospitals, the medical staff are also directly accountable to the governing body for the patient care provided., Hence, the governing body has the overall responsibility for the quality and safety of care and has an oversight role in integrating the responsibilities and work of its medical staff, chief executive, and other senior managers into a system that achieves the goals of safe, high-quality care, financial sustainability, community service, and ethical behavior. This is also the reason that all three leadership groups, the governing body, CEO and senior managers, and leaders of the medical staff must collaborate if these goals are to be achieved. This study is a descriptive, analytical, and comparative research that was carried out in two phases. The first was development of primary checklist of leadership and management accreditation standards in hospitals based on comparative study and the second was consensus and validation of checklist through three rounds of Delphi technique. The study population in the first stage was leadership and management standards of accreditation system in various countries including the United States of America, Egypt, and Malaysia, and in the second stage was experts in accreditation system of Iran. Inclusion criteria in the comparative study were countries who have had an effective accreditation system and countries which had similar cultural context with Iran. The USA was selected due to their pioneering and leadership role in accreditation in the world and effective accreditation systems, Egypt and Malaysia were selected because of their leading position in use of accreditation in developing countries and cultural affinity with Iran. Many countries could have been selected for the study, but because of resource and time limitations, just these three countries were selected for our study. We survey the accreditation literature of these countries to identifying leadership and management standards of their accreditation systems. Inclusion criteria in the Delphi phase were experts having knowledge, work experience, and had done research in accreditation of hospitals. Sampling method in the first phase was targeted nonrandom sampling methodology, and in the second phase was snowball methodology. In Delphi phase, 12 experts were selected who had various research and work experiences in hospital accreditation and were interested in participating to the rounds of the present study. Experts were selected from university faculties, hospital managers, and Ministry of Health and Medical Education' officials. Ten experts were from Isfahan and 2 experts were from Tehran. It was carried out three rounds of Delphi. We used printed checklists for experts in Isfahan city and E-mail for experts in Tehran. Qualitative data were analyzed by content analysis interpretatively and critically. In the first round of Delphi technique, we wanted participants that indicate their rating of the presentation in the categories of checklist by circling the appropriate number, using a scale of 1 (low) through 5 (high). In addition, we want them to fill out comment box of checklist form if they thought necessary. Then, we calculated each standard final score from participant's responses on the scale of 0 through 75. Those standards that obtain total score of below 40 were eliminated for the second round. We revised the residual standards based on their comments, but it was kept body of standards. At the second and third rounds of Delphi in order to have participants 'consensus, we wanted from experts to give us their opinion about revised standards. In these rounds, checklist revolved inconsequential. Using of Delphi technique standards that were unsuitable for Iran were eliminated and standards revised. Finally, experts consented on standards. After the review of the accreditation standards of selected countries and Iran, we identified leadership and management standards in these countries and translated into Persian language. Then, these standards were compared based on four aspects of leadership and management including board of trusts, medical staff, CEO, and nursing management. As shown in [Table 1], the USA had developed 7 boards of trustee's standards, Malaysia 11, and Egypt had 4 standards. In medical staff area, the USA and Egypt have 18 and 10 standards, respectively, and did not find any standards for Malaysia. Standards related to CEO were 2 in USA and Malaysia and 5 in Egypt. In nursing management accreditation system in the USA, Malaysia, and Egypt included 8, 5, and 10 standards respectively. 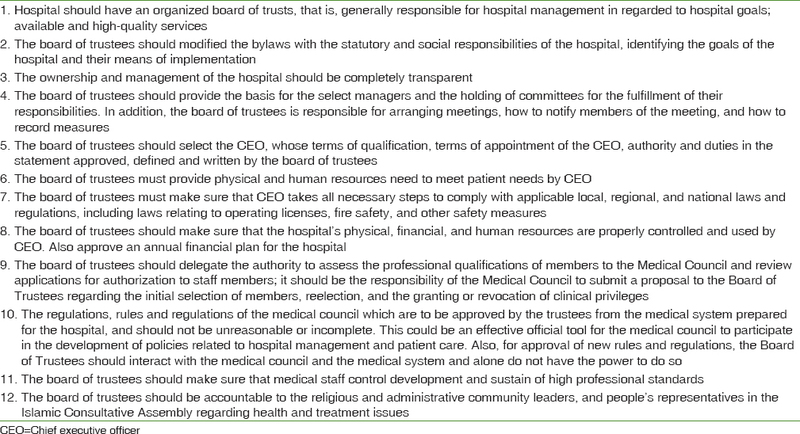 After that, the primary checklist of leadership and management standards was developed that included 15 standards related to board of trusts, 10 standards related to medical staff, 13 standards in CEO aspect, and 6 standards of nursing management. After the use of Delphi technique, a final framework developed that contains 12 standards in board of trustees, 8 standards related to medical staff, 9 standards of CEO, and 6 standards related to nursing management. Standards of various aspects are shown in [Table 2], [Table 3], [Table 4], [Table 5]. There must be a mechanism for services and products evaluation in order to provide services with high quality in all organizations. In health-care organizations, it was carried measures in last years for evaluation of health-care services, especially in hospitals as most important health-care structures. Primary health-care organizations evaluation systems were based on quality control systems. Over time health systems in developed countries tend to accreditation systems. It was included, evaluation of structure, process and output in hospitals and other health-care organizations and it was accompanied by periodic certificates. Iran runs his hospital accreditation system based on accreditation standards for hospitals guidelines. Accreditation standards included, all of clinical and nonclinical wards of hospitals, such as leadership and management aspects that is definitely most effective component in order to acquire services goals; high-quality service delivering, and make safety for patients and staffs. In addition, it provides financial stability for hospitals as organizations. Historically, the board of trustees' functions varied in different cultures and communities. Each hospital has a leadership and management structure for supporting operations and delivering care. In many hospitals, this structure formed by leadership and management groups such as board of trustees, CEOs, and organized medical staff and nursing assistant. Board of trustees in health-care organizations have same responsibility with business and enterprise organizations. These four pillars are considered as main pillars of leadership and management in hospitals. Thus, for evaluation and accreditation of hospitals must considered these pillars. Quality of services is dependent to high participation of physicians and other clinical specialists and clinical staffs and board of trustees have an effective and axillar role in allocation of resources. Medical staff and nursing assistant as organized structures can help to clinical staff participation on decision-making and hospital planning. Each hospital that seeking to improve the quality and safety of health-care services should develop and document roles, functions, and communications between these four pillars. Furthermore, delegate management of its daily operations to these four pillars that provide bases for responsibility and accountability. The hospital board of trustees is responsible for quality and safety of health-care services. If medical staff interested in collaboration and coordination many of board of trustees have an acceptable performance. The board of trustees must commit the medical staff to participate in quality care education and encourage them to join the board of trustees. Based on the results of the study, every hospital must have a leadership structure to support operations and the provision of care. In many hospitals, this structure is formed by three leadership groups, the governing body, senior managers, and the organized medical staff. Regardless of how the assignments of individuals are made, those who are responsible for the governance of the hospital must be clearly identified. The authors want to express a special recognition to the specialists who have participated in the study, without whom the study could not be possible. This study was financially supported by Isfahan University of Medical Sciences, Isfahan, Iran. Hall MJ, DeFrances CJ, Williams SN, Golosinskiy A, Schwartzman A. National Hospital Discharge Survey: 2007 Summary: US Department of Health and Human Services, Centers for Disease Control and Prevention. National Center for Health Statistics; 2010. Rosen AK, Singer S, Shibei Zhao, Shokeen P, Meterko M, Gaba D, et al. Hospital safety climate and safety outcomes: Is there a relationship in the VA? Med Care Res Rev 2010;67:590-608. Tsai TC, Joynt KE, Orav EJ, Gawande AA, Jha AK. Variation in surgical-readmission rates and quality of hospital care. N Engl J Med 2013;369:1134-42. Smits H, Supachutikul A, Mate KS. Hospital accreditation: Lessons from low- and middle-income countries. Global Health 2014;10:65. Jiang HJ, Lockee C, Fraser I. Enhancing board oversight on quality of hospital care: An agency theory perspective. Health Care Manage Rev 2012;37:144-53. Shaw C. External assessment of health care. BMJ 2001;322:851-4. Tamuz M, Harrison MI. Improving patient safety in hospitals: Contributions of high-reliability theory and normal accident theory. Health Serv Res 2006;41:1654-76. Wasson JH, Godfrey MM, Nelson EC, Mohr JJ, Batalden PB. Microsystems in health care: Part 4. Planning patient-centered care. Jt Comm J Qual Saf 2003;29:227-37. Sartang AG, Yazdi H, Jabbari A, Niknam N, Naghdi B, Jafari H, et al. Evaluation of safety management indexes in amin educational hospital Isfahan in 2013. Glob J Med Res Stud 2014;1:125-9. Manojlovich M. The effect of nursing leadership on hospital nurses' professional practice behaviors. J Nurs Adm 2005;35:366-74. Reeleder D, Goel V, Singer PA, Martin DK. Leadership and priority setting: The perspective of hospital CEOs. Health Policy 2006;79:24-34. Fletcher D, Wagstaff CR. Organizational psychology in elite sport: Its emergence, application and future. Psychol Sport Exerc 2009;10:427-34. Fisher ES, Staiger DO, Bynum JP, Gottlieb DJ. Creating accountable care organizations: The extended hospital medical staff. Health Aff (Millwood) 2007;26:w44-57. Goeschel CA, Wachter RM, Pronovost PJ. Responsibility for quality improvement and patient safety: Hospital board and medical staff leadership challenges. Chest 2010;138:171-8. Alexander JA, Lee S-YD. The effects of CEO succession and tenure on failure of rural community hospitals. J Appl Behav Sci 1996;32:70-88. De Savigny D, Adam T. Systems Thinking for Health Systems Strengthening. Geneva, Switzerland: World Health Organization; 2009. Anderson DJ, Webster CS. A systems approach to the reduction of medication error on the hospital ward. J Adv Nurs 2001;35:34-41. Cummings G, Hayduk L, Estabrooks C. Mitigating the impact of hospital restructuring on nurses: The responsibility of emotionally intelligent leadership. Nurs Res 2005;54:2-12. Rad AM, Yarmohammadian MH. A study of relationship between managers' leadership style and employees' job satisfaction. Int J Health Care Qual Assur Inc Leadersh Health Serv 2006;19:xi-xviii. Horty JF, Mulholland DM. The legal status of the hospital medical staff. St. Louis Univ Law J 1978;22:485. Association AP. The Principles of Medical Ethics: With Annotations Especially Applicable To Psychiatry. American Psychiatric Pub Incorporated; 2001. Donahue KT, vanOstenberg P. Joint commission international accreditation: Relationship to four models of evaluation. Int J Qual Health Care 2000;12:243-6. Linstone HA, Turoff M. The Delphi Method: Techniques and Applications. Addison-Wesley Reading, MA; 1975. Joint Commission on Accreditation of Healthcare Organizations, Joint Commission Accreditation Hospital. Comprehensive Accreditation Manual for Hospitals: The Official Handbook: Camh. Joint Commission Resources; 2007. Al Tehewy M, Salem B, Habil I, El Okda S. Evaluation of accreditation program in non-governmental organizations' health units in Egypt: Short-term outcomes. Int J Qual Health Care 2009;21:183-9. Jones J, Wilson A, Parker H, Wynn A, Jagger C, Spiers N, et al. Economic evaluation of hospital at home versus hospital care: Cost minimisation analysis of data from randomised controlled trial. BMJ 1999;319:1547-50. Yusof MM, Kuljis J, Papazafeiropoulou A, Stergioulas LK. An evaluation framework for health information systems: Human, organization and technology-fit factors (HOT-fit). Int J Med Inform 2008;77:386-98. Abdul Rahman R, Haneem Mohamed Ali F. Board, audit committee, culture and earnings management: Malaysian evidence. Managerial Auditing J 2006;21:783-804.